Well, here’s an episode to convince me that the writers just don’t care anymore. Another week, another final act that absolves Peter of any wrongdoing, which then sets about directly commenting on how absurd it is that he always escapes unscathed from any dangerous situation. Tonight, Peter and Quagmire help Mort burn down his pharmacy to collect the insurance money, but Joe vows to do due diligence on the investigation for Mort since they’re friends. The episode was at least in part about insurance companies and how the characters on Family Guy believe those companies to be malicious in how they seek profit at the expense of their customers. In typical Family Guy, the issue of price gouging insurance companies and their unwillingness to pay benefits gets a few on-the-nose lines from each character as they say generally negative things about the insurance industry. Nothing specific, no real sentiment other than “insurance companies = BAD” over and over again. Lois barely has any lines in the episode, and aside from a brief joke in the first scene where Stewie describes dropping a Flintstones vitamin and going to a baby rave, he and Brian are barely present either. Chris and Meg are nowhere to be found. Instead, we get Mort, one of the more insubstantial bit players in a show riddled with underdeveloped tertiary characters. The Jewish humor surrounding Mort is of the typical quasi-anti-Semitic variety, the same kind of material that landed Family Guy in hot water in “When You Wish Upon a Weinstein” — just not as the central plot of the episode. Mort doesn’t understand the phrase “get one free” when referring to a potential sale in his own store, but the instant Peter flips a sentence around so that it benefits Mort, he’s giddy with the possibility of getting free stuff. He says there are parts of the Torah for writing complaint letters and committing insurance fraud. Joe reads “Jewish Miranda Rights” to Mort, giving him the right to an attorney he’s related to, and the right to take Joe’s statements out of context as insults. Family Guy can do strong referential humor, and occasionally the religious jokes land, but racial and ethnic humor is definitely not one of its strong suits. Mort is just a punching bag, a never-ending deposit of repetitive Jewish jokes that never rise above derivative. Mort goes through an easy conversation with a claims investigator after the fire, Joe get to tell his story about a medical insurance company screwed him over after the accident that left him paralyzed. Other than those two moments, there wasn’t any attempt at mining the incredibly complicated and seemingly backwards world of insurance for comedy. It was barely discussed, and in its place Peter, Quagmire, and Mort wrung their hands during several conversations where all they discussed was the likelihood of getting caught by Joe — stalling for a few more minutes with texts about meeting up for dinner until Joe connects the dots. 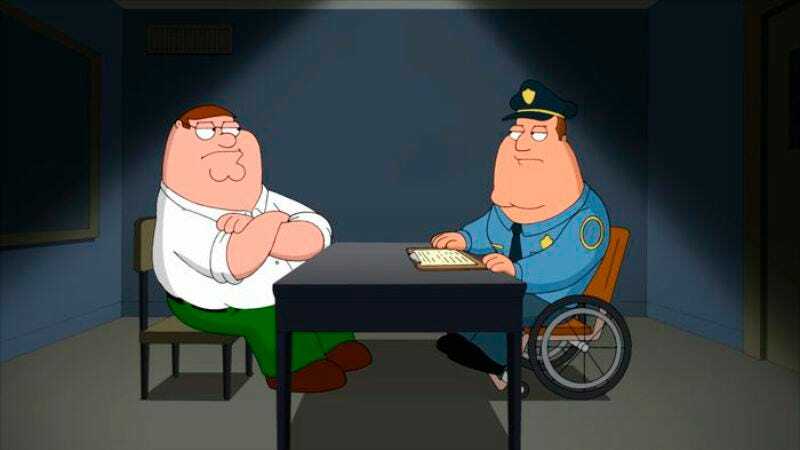 The final few minutes, when Peter, Quagmire, and Mort are released, and the Griffin family muses for about the fiftieth time just how miraculous it is that Peter suffered no consequences from his actions, I promptly forgot everything about the plot of this episode aside from a handful of lines. At this point, Family Guy is a funnier string of YouTube videos than it is a television show. If there are funny moments, finding them on Hulu or YouTube is a better use of finding laughs with familiar characters than sitting through an actual episode of the show. When Family Guy tries to grandstand on a particularly skewed opinion, at least it carries some perspective. More often the show chooses to give on-the-nose positions to Brian instead of Peter and his friends, as was the case tonight. Regardless of whether anyone agrees with what Seth MacFarlane and his writing staff uses their soapbox to say, they usually project an unreliably informed opinion with such blind vigor that it merits a reaction. 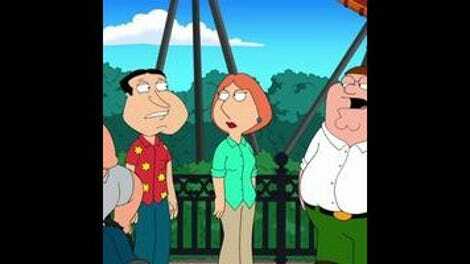 But lately Family Guy has been incapable of even drawing out that response, devoid of a clear point of view. I enjoyed the cutaways quite a bit tonight, but I think that was simply because the only plotline of the episode was so lacking in direction that cutting away from the story into an out of context clip was the only way to get laughs. Best cutaway: I’m going to pick Robocop on his day off. I’ve got a friend who tried to write a stage musical version of the original film that should never see the light of day, but he got a huge kick out of that five second clip. Worst: that Beatles on Ed Sullivan cutaway was pretty awful. Quagmire really enjoys his peaceful gardening for some reason. No pregnant woman should ever visit the Museum of Staircases and Spring-Loaded Boxing Gloves.